What is an industrial compression spring? Definition: Helical coil compression springs manufactured for industrial machines and devices. Compression springs are utilized in a lot of everyday industrial devices and sometimes, one isn’t even aware of the fact that some of these industrial machines need springs in order to function correctly. Industrial compression springs though, are installed into industrial machinery. From the smallest machine inside a factory to even heavy duty construction machinery. You may find industrial compression springs in heavy equipment, hardware, machine tools, agricultural equipment, assembly lines, industrial robots, oil refineries, paper mills, saw mills, mining equipment, construction equipment, and the list goes on. Acxess Spring specializes in making industrial compression springs for any of the industrial machinery devices previously mentioned. We make sure to be as precise as possible in the manufacturing of your industrial compression spring. Every dimension specified by the customer shall be considered and made to specification as required to make sure that your springs work remarkably in your industrial machine or device. You may also find industrial compression springs at The Spring Store; our online store in which you can shop for stock industrial compression springs fast by using our compression spring finder. The finder only requires for you to input two of your industrial compression spring’s physical dimensions to automatically search through our catalog and give you the results of the stock compression springs which are most similar to the dimensions you entered. You may also do an advanced search where you are able to input more of your spring’s dimensions to make your search more specific. 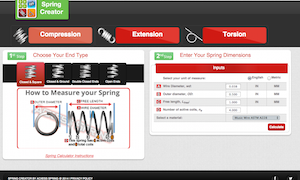 Design your industrial compression spring using our online spring calculator, Spring Creator. Spring Creator is an advanced and powerful design tool made to make the task of designing a compression, extension, or torsion spring a lot faster and easier. No more figuring out complex formulas or making prototype after prototype. With spring creator you are given all the information required with only a few of your spring’s physical dimensions including material type. From spring rate to maximum loads and travel so you’re sure that your spring will meet your required working loads. As you design your spring you will also be notified through The Spring Store if the are any similar springs in stock to the one you are currently designing. This means that you can shop for prototypes as soon as you’ve finalized your design all in one website. Use Spring Creator on the go by downloading the app on your mobile android device (smart phone or tablet). It includes all the features previously mentioned. From being provided with stock spring options to creating a real-time blueprint of your actual industrial compression spring design.